New York Court Watcher: New--and hopefully clearer--Graphs for "New York Court of Appeals: The Jones Factor in Criminal Cases (Part 2)"
New--and hopefully clearer--Graphs for "New York Court of Appeals: The Jones Factor in Criminal Cases (Part 2)"
The following two graphs are hopefully clearer than the one included in yesterday's post on the New York Court Watcher. (See New York Court of Appeals: The Jones Factor in Criminal Cases (Part 2) , August 19, 2008.) Clearer both visually and substantively. The original graph did not copy very well [not my fault], and it crammed in a lot of information [my fault]. Each of the two new graphs, derived from the original, have larger font and less info. The first graph contrasts the voting in criminal cases by Judge Theodore Jones with that of Judge Albert Rosenblatt whom he replaced. The voting figures represent the percentage of divided criminal decisions in which each judge took the more pro-defendant position on the issue which divided the court. For Rosenblatt, the percentages are, respectively, for the five year and two year periods preceding Jones' appointment to the court. For Jones, the percentage is for the entire year and a half since his appointment, replacing Rosenblatt, in February 2007. 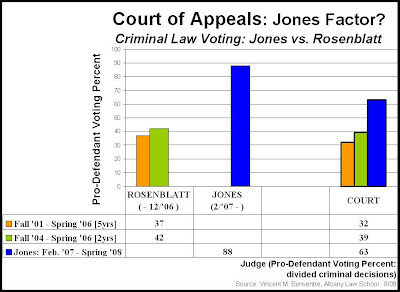 As discussed in yesterday's post, and as depicted (hopefully quite clearly) in the graph, Jones' voting has been substantially more favorable to the accused--more than twice as favorable--than was Rosenblatt's. And since Jones' appointment, the court's decisional record has moved--again quite substantially--in the same direction. GRAPH 1, above, says it all. The second graph depicts the voting record of each of Jones' colleagues since his appointment, together with his own and the decisional record of the court as a whole. 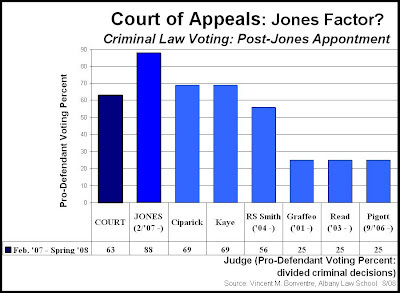 Again, as discussed in yesterday's post and as depicted in the graph, three of the current judges have compiled strongly to very strongly pro-defendant voting records since Jones' appointment (i.e., Cuomo appointees Chief Judge Judith Kaye and Judge Carmen Ciparick, and Spitzer appointee Jones himself). One of the judges has a voting record that is moderately pro-defendant (i.e., Pataki appointee Judge Robert Smith). And three have strongly pro-prosecution voting records (i.e., Pataki appointees Judges Victoria Graffeo, Susan Read, and Eugene Pigott). Viewed another way, a majority of the current Court of Appeals judges--four of the court's seven members--have pro-defendant voting records. Indeed, their records are markedly more pro-defendant (more than two times to more than three times pro-defendant) than the records of their three remaining colleagues. GRAPH 2, above, illustrates all of this rather starkly. Well, hope this all helps to unjumble and to underscore some of what has been changing in the decisional record of the New York Court of Appeals in criminal cases.